Much like the Lake, the answer is not clear. NC DENR is seeking permission from the Army Corps of Engineers to deploy SolarBee circulation units in Jordan Lake this spring. 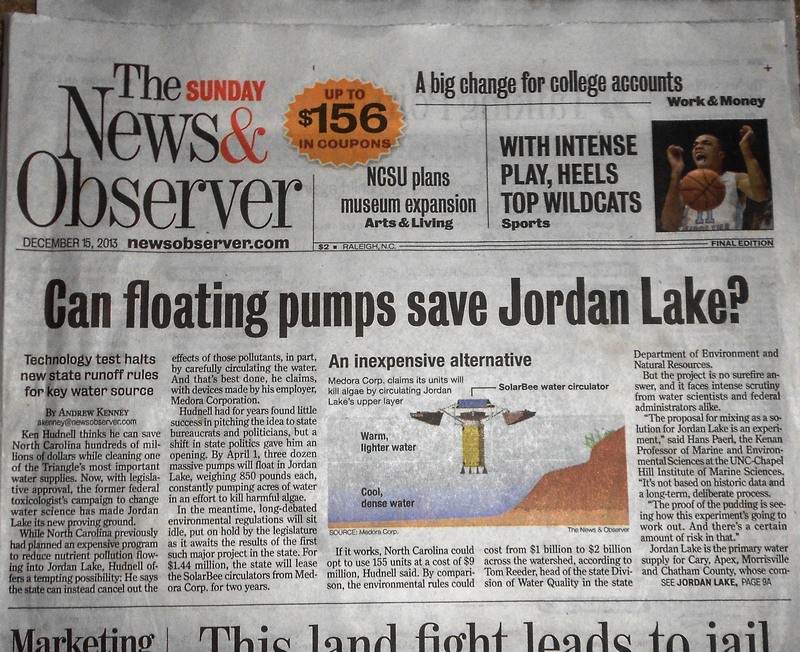 As reported by the N&O, the technology has little record of its performance in a lake the size of Jordan. A check of the Medora website, the manufacturer of the Solar Bee (SB), touts the promise of the technology but I wanted to dig a little to find more substance of its performance. Here’s some of what I found. First, the SB will be attempting to treat the symptons of excess nutrient flow to the reservoir. That is, the technology circulates the water and impedes the growth of algae that is fed by excessive levels of nutrients. (I documented that pollution in a previous post.) It’s not a new concept as aeration and circulation have been tried in other environments such as the Chesapeake Bay. One promising SB application Medora cites on its website is at Lake Palmade in California. There, a 220 acre lake with 7 circulators helped reduce the use of the algaecide copper sulfate by 85%. At two other similarly sized lakes, cyanobacteria levels (i.e. harmful algae) were significantly reduced. Since the entirety of Jordan does not have nutrient related water quality impairments, SB would not be needed throughout the entire lake. Currently, the state is seeking to put 36 machines in the upper, most polluted portion of the lake. One of the many questions with SB would be whether they would reduce turbidity, one of the constituents for which Jordan Lake is impaired. Another brought up by Dr. Bill Wilson in this past weekend’s N&O article is the risk of increasing mercury concentrations in fish due to algae suppression without reducing polluted runoff to the Lake. Dr. Ken Hudnell, Medora’s science advisor, promotes that in-lake measures like SB should be used in combination with “the most effective and cost-efficient practices of watershed management” (Hudnell 2013). While the technology may be worthy of testing, it hasn’t proven that it, by itself, would be the solution to ridding Jordan Lake of its impairments. It is certain that nutrient reduction measures help improve lake water quality. Given the uncertainty associated with the technology, Jordan would benefit most by maintaining the current measures to curb pollution (i.e., sewage treatment plant upgrades, streamside forest protections, enhanced stormwater treatment for new development). Hudnell, HK. 2013. An alternative approach to regaining designated uses of clean water act section 303(d) impaired waters. Florida Water Resources Journal., 65: 20–26. Attempt making use of the sides of the field.